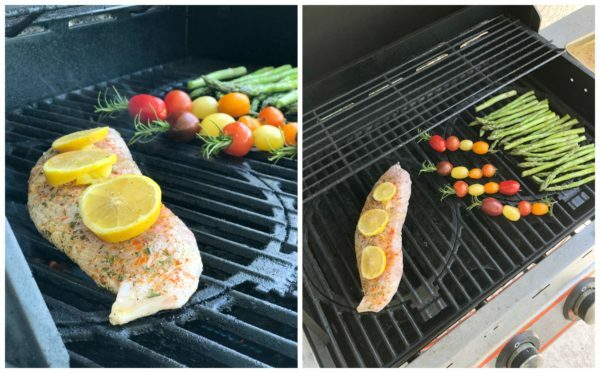 Grilled Lemon Garlic Red Snapper is a delicious and healthy recipe you can make for lunch or dinner in under 30 minutes! Woah–I never intended to take last week off. It was my son’s first week of school and I was eager to get some work done while he was at school (still tending to the toddler). However, he was hit with the nastiest virus I’ve ever seen and he’s still sick. I had no time to write and just enough time to cook meals for our family. While I dealt with a sick child and a hyper-active toddler who had no concept of her brother being sick–my husband had planned to go red snapper fishing. In Florida you only have two long weekends (Friday-Sunday) to catch a red snapper. It’s also a one red snapper per person rule. You better believe that anyone who loves to deep sea fish is on the water those two weekends. The first weekend my husband went with friends and didn’t catch a single fish. Insert very disappointed husband. I felt bad for him, so I encouraged him to go the following weekend. You see, since having kids he is lucky to go out deep sea fishing a handful of times each year. When I encouraged him to go he said he would try to go on a Friday so it didn’t disrupt our weekend. Even better for me. However, when I agreed to this I couldn’t have predicted that my son would be crazy sick with a virus. My husband was gone for 17.5 hours, had a blast, and brought home so much fish. It’s a good thing, since I had to schlep both kids to the pediatrician’s office and deal with a very sick child. He caught a nice 25-30lb red snapper and between all the guys on the boat he came home with 3 dinners worth of red snapper! I rarely share personal photos, but I couldn’t resist! Look at these red snappers (and cobia)!!! I whipped up this Grilled Lemon Garlic Red Snapper, for lunch over the weekend. It was probably the fanciest lunch I’ve made for us in a very long time. Below I’m going to share all the details about our red snapper meal. How do you season red snapper? The first thing you want to do is season your fish very well. I used a combination of olive oil, salt, black pepper, and garlic powder as the base. Then I added in a little paprika for color and additional flavor and dried parsley flakes. Fresh parsley works too, but I was working fast and decided to just grab everything I had from the pantry! After I seasoned the red snapper, I then juiced half a lemon directly over the fish. The acidity from the lemon compliments the fish and gives an additional layer of flavor. Lemon is also a great substitute for salt. Keep that in mind if you are trying to cut back on salt. How do you cook red snapper? 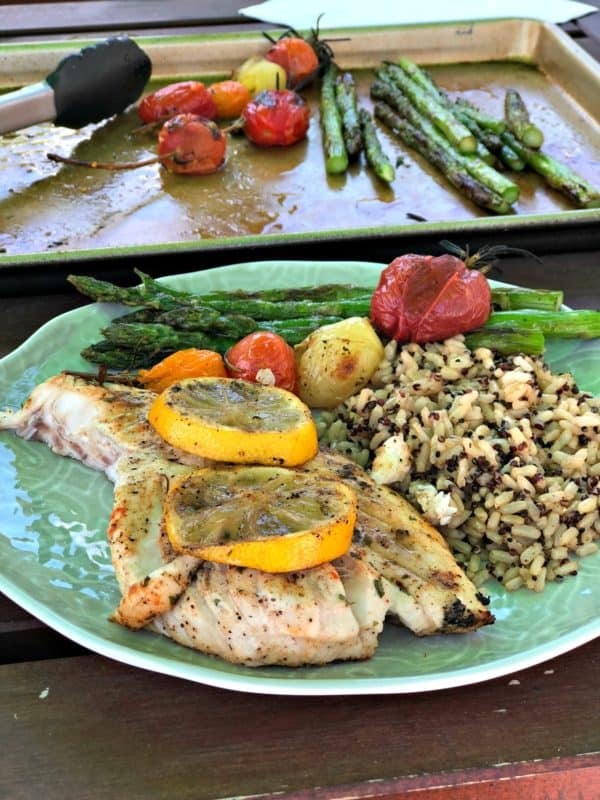 I’ll be honest–I wanted to bake this red snapper, but it was so hot out and my husband and daughter were swimming by the pool. I forced myself to keep our house cool and grill the snapper. I pre-heated the grill on high heat and then reduced down to low. You absolutely MUST apply non-stick cooking spray to your grill or the fish will stick to the grill grates and it will be ruined! Depending on the thickness of your fish will depend on the time you will need to cook it. I first started with 5 minutes on each side and then added an additional 5 minutes for a total of about 15 minutes. If you have a thinner, smaller piece of fish the 5 and 5 method should work. Want to bake the fish? No worries, follow this same recipe and cook at 400 for the same amount of time the recipe indicated. 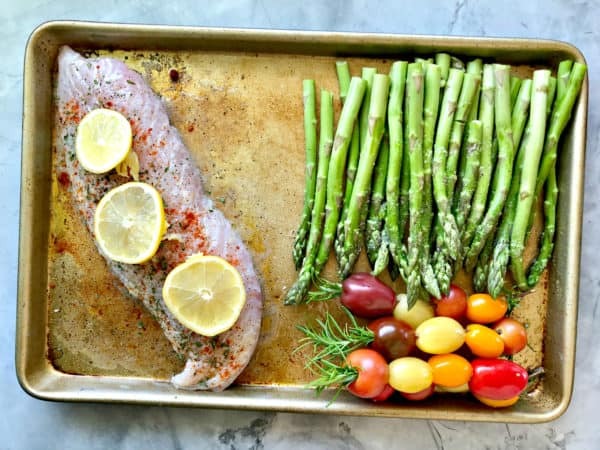 Another tip, I like to use a glass baking dish when I cook fish! What are the health benefits to red snapper? Red snapper is a low-calorie, lean source of protein that is rich in selenium, vitamin A, potassium and omega-3 fatty acids. A diet that regularly incorporates these nutrients may significantly benefit your health by preventing serious medical conditions. Despite the potential health benefits, red snapper may contain mercury levels that make it unsafe for pregnant women and young children to eat more than a few times a month. However, if it’s safe for you to eat in moderation, it can provide nutrients. Facts about Red Snapper found here. All of the tools I’m about to list are all tools that I use on a daily basis in my kitchen and some of my favorites! 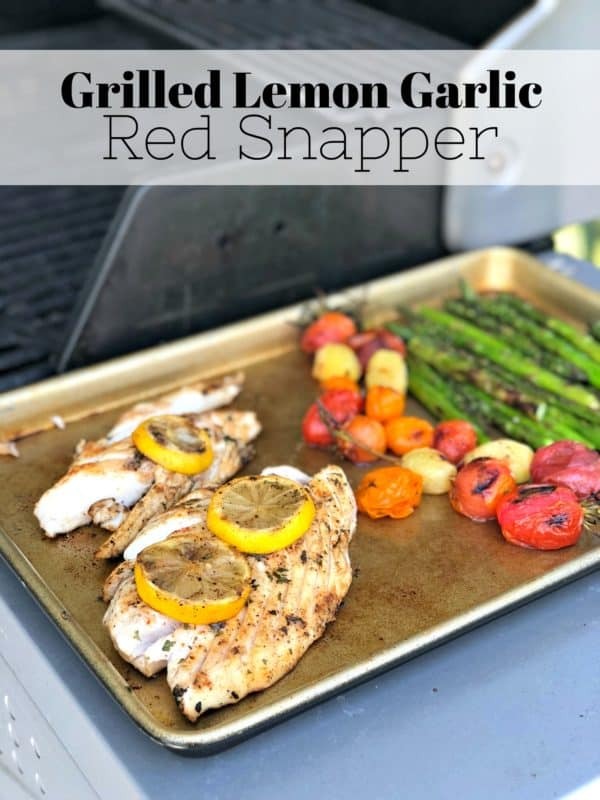 If your looking for a healthy and new way to cook red snapper I hope you’ll give my easy recipe for Grilled Lemon Garlic Red Snapper. Preheat the grill to high heat. While the grill heats begin seasoning the fish. Pour the olive oil over the red snapper. Then sprinkle half the salt, black pepper, garlic powder and paprika over the finish. Massage into the fish. Flip over and repeat. Flip the fish back over and sprinkle the dried parsley on top. Cut the lemon in half. Juice one half of the lemon and drizzle over then slice the other half of the lemon and place on top of the fish. Reduce the heat on the grill to low. Spray the grill grates with non-stick cooking spray. Carefully, place the fish on top of the grill grates. Grill with lid closed for 7 minutes. Using tongs, remove the lemon slices from the top of the fish and place on the grill grate. Carefully, using a spatula, flip the fish. 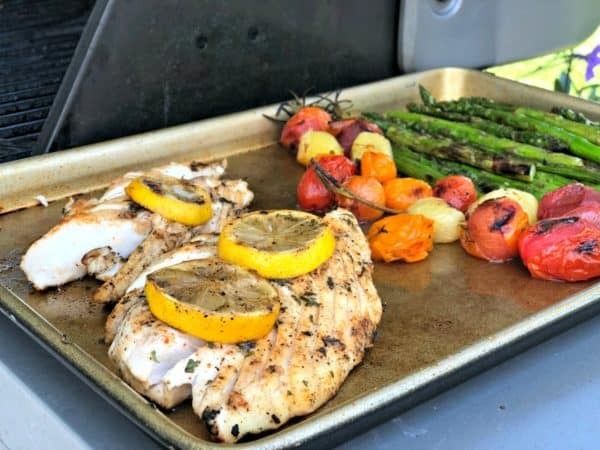 Place the lemon slices back on the fish, close the lid and grill for an additional 7 minutes or until internal temperature reaches 165 degrees Fahrenheit and the fish is cooked through. Cut fish into slices (if whole filet), divide among plates, and enjoy immediately.